Kokam is a dark red colored fruit. 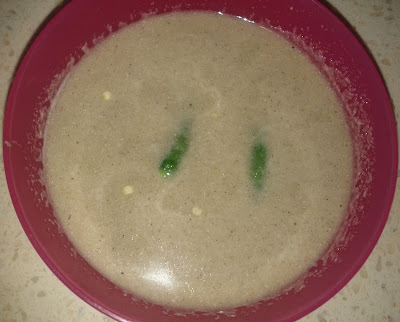 Kokum Kadhi / Curry is a Goan / Konkan drink. It is good for digestion and acts as a cooler. Can have it lukewarm or chilled as a drink or along with plain rice. This is a curry prepared with no boiling process involved. Kokum Kadhi is very tangy and easy to make. Some people temper this curry with red chilly, mustard seeds.cumin seeds and curry leaves. This is made out of coconut milk and garlic cloves. Thus, this curry is little sour and spicy and can consumed as an appetizing drink. It gives a soothing effect by having it on hot summer. Number of chilies depend on how spicy they are. I am using 5 as mine are not very spicy. Can serve the kokum kadhi immediately or can keep it in a fridge and then serve cold. Remember, leftover kokum kadhi should be refigerated as coconut milk can get spoiled in the hot weather. Can add a pinch of asafoetida also. Soak kokum in water for 30 minutes. Strain and squeeze them completely to get a beautiful pinkish red color extract, which will be sour. Grind / Blend to make a paste of above mentioned ingredients in "to be grinded" table with sufficient water. Strain the above paste and pour it in a jug or bowl. Add kokum water extract to it. Add salt and garnish with coriander leaves. Serve hot with plain rice or as a appetizing drink.